Syama Prasad Mookerjee was born in a Bengali family on 6 July 1901 in Calcutta (Kolkata). His father was Sir Ashutosh Mukherjee, a judge of the High Court of Judicature at Fort William, Bengal, who was also Vice-Chancellor of the University of Calcutta. His mother was Lady Jogamaya Devi Mukherjee. Eminent writer and Himalaya lover Uma Prasad Mukhopadhyay was his younger brother. Syama Prasad grew up to be “an introvert, rather insular, a reflective person; also an emotional person”, who needed someone else by his side to give him emotional support. He was seriously affected by the early death of his wife Sudha Devi and never remarried. Mookerjee obtained his degrees from the University of Calcutta. Syama Prasad was elected Fellow of Calcutta University at the age of 23. He was appointed member of the Syndicate of the Calcutta University in the place fallen vacant due to the death of Sir Ashutosh and very soon it became apparent that the mantle of his illustrious father had fallen upon his broad shoulders in the educational sphere. He made the University his own, as his distinguished father had done before him, serving it with single minded devotion. He enrolled as an advocate in Calcutta High Court in 1924 after his father had died. Subsequently he left for England in 1926 to study at Lincoln’s Inn and became a Barrister-at-Law in 1927. There, he represented the Calcutta University at the conference of Universities of the British Empire. At the age of 33, he became the youngest Vice-Chancellor of the University of Calcutta, for two successive terms – 1934-38, President, Post-graduate Councils in Arts and Science for successive years. He also held the chair of the Dean of Faculty of Arts, Member and then Chairman, Inter-University Board. During the four years of his service as the Vice-Chancellor, Syama Prasad did not spare time, energy, health, convenience or anything worth having in life; where they stood in the way of the performance of what he considered his duty and this he did against the advice of his doctors. He initiated certain new departments and courses and developed and improved existing ones. In 1935, he became Member of the Court and Council of the Indian Institute of Science, Bangalore. He also took an active interest in its development and smooth running of the institute. In 1937, he was elected to the Bengal Legislative Assembly under the reformed constitution from the University constituency. That was when he began to take active interest in Bengal Politics. Syama Prasad Mookerjee started his political career in 1929 as member of the Legislative Council of Bengal, as an Indian National Congress candidate representing Calcutta University but resigned the next year when Congress decided to boycott the legislature. Subsequently, he contested the election as an independent candidate and was elected. He became the opposition leader when the Krishak Praja Party – Muslim League coalition was in power 1937-41 and joined the Progressive Coalition Ministry headed by Fazlul Haq as a Finance Minister, but resigned within a year. He joined the Ministry as Finance Minister, Bengal and served the Progressive Coalition Ministry from 11.12.1941 to 20.11.1942. This was the first and the last Hindu-Muslim joint ministry in Bengal, and his earnest effort to get Bengal rid of communal administration perused by the Muslim League Ministry. Syama Prasad gradually drifted into the fold of the Hindu Mahasabha, which he galvanized into new life as an instrument for the service of the country in general and Hindus in particular. He took prominent part in the 21st session of the All India Hindu Mahasabha at Calcutta under the Presidentship of Veer Savarkar. In 1940 he became working President of All India Hindu Mahasabha, Bengal and also President of Hindu Mahasabha in 1944. Syama Prasad’s association with the Hindu Mahasabha was the outcome of his strong reaction to the communal politics of the Muslim League and the anti-national and disruptive forces let loose by it. Mookerjee adopted causes to protect Hindus against what he believed to be the communal propaganda and the divisive agenda of the Muslim League. Mookerjee and his future followers would always cite inherent Hindu practices of tolerance and communal respect as the reason for a healthy, prosperous and safe Muslim population in the country in the first place. Mookerjee was a political leader who felt the need to counteract the communalist and separatist Muslim League of Muhammad Ali Jinnah, who were demanding either exaggerated Muslim rights or a Muslim state of Pakistan. The Bhagalpur session of the Hindu Mahasabha was banned by the then Governor of Bihar. Dr. Mookerjee, as President, proceded to Bhagalpur to defy the ban and was arrested and detained under the Defense of India Rules and later released. 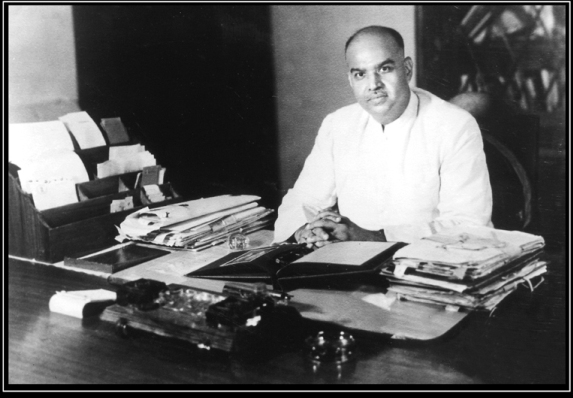 Dr. Mookerjee took part in Cripps Mission deliberations, first among the political parties to reject the Cripps offer which gave support to Muslim League’s demand for the partition of India on a communal basis. Syama Prasad Mookerjee was initially a strong opponent of the Partition of India, but following the communal riots of 1946-47, he strongly disfavored Hindus continuing to live in a Muslim-dominated state and under a government controlled by the Muslim League. He wanted the Hindu Mahasabha not to be restricted to Hindus alone or work as an apolitical body for the service of the masses. Following the assassination of Mohandas K. Gandhi by Nathuram Godse, the Mahasabha was blamed chiefly for the heinous act and became deeply unpopular. Mookerjee himself condemned the murder. His views were strongly affected by the Noakhali genocide in East Bengal. On the failure of the Cabinet Mission to solve the problem relating to the transfer of power to Indian Leaders, the Muslim League under the instruction of Jinnah and “guidance” of H. S. Suhrawardy, launched the “direct action” against Hindus in Calcutta on 16th August, 1946. Rampant looting, killing & arson went on for four days. This was followed by a gruesome series of massacres, brutal rapes, abduction and forced conversions of Hindus and looting and arson of Hindu properties, perpetrated by the Muslim community in the districts of Noakhali in the Chittagong Division of Bengal in October – November 1946—a year before India’s independence from British rule. Syama Prasad resigned from the Ministry of Bengal as a protest against the Governor’s policy of repression in Midnapore and elsewhere in connection with August 1942 quit India Movement. Mookerjee supported the partition of Bengal in 1946 to prevent the inclusion of its Hindu-majority areas in a Muslim-dominated East Pakistan. He also opposed a failed bid for a united but independent Bengal made in 1947 by Sarat Bose, the brother of Subhas Chandra Bose and Huseyn Shaheed Suhrawardy, a Bengali Muslim politician. Although he was an ardent believer in the integrity of the country that he loved so much, when he found that the division of India had become imminent and the emergence of Pakistan inevitable, he joined hands with similar minded leaders in demanding a division of Bengal using the same logic as applied to the rest of India. Thus a portion of Bengal, now named as West Bengal, was saved from the clutches of the Muslim League and remained with the Indian Union. India’s first Prime Minister Jawaharlal Nehru inducted him in the Interim Central Government as a Minister for Industry and Supply. Dr. Mookherjee was widely respected by many Indians and also by members of the Indian National Congress and Sardar Vallabh Bhai Patel, one of its chief leaders. On the issue of the 1949 Delhi Pact with Pakistani Prime Minister Liyaqat Ali Khan, Mookerjee resigned from the cabinet on April 6, 1950. He was firmly against Nehru’s invitation to the Pakistan PM, and their joint pact to establish minority commissions and guarantee minority rights in both countries. He wanted to hold Pakistan directly responsible for the terrible influx of millions of Hindu refugees from East Pakistan, who had left the state fearing religious suppression and persecution aided by the state. Dr. Mookherjee considered Nehru’s actions as appeasement, and was hailed as a hero by the people of West Bengal. After consultation with Madhav Sadashiv Golwalkar, leader of the Rashtriya Swayamsevak Sangh, Dr. Mukherjee founded the Bharatiya Jana Sangh on October 21, 1951 at Delhi and became its first President. In the 1952 General Elections to the Parliament of India, Dr Mookerjee and Bharatiya Jana Sangh won 3 seats. Jan Sangh criticised favouritism to India’s Muslims by the Nehru administration and promoted free-market economics as opposed to the socialism in Nehru’s economic and social policies. Bharatiya Jana Sangh also favoured a Uniform Civil Code for both Hindus and Muslims, wanted to ban cow slaughter and end the special status of Muslim-majority, Jammu and Kashmir. He opposed the Congress decision to allow J&K to be a special state and have its own Flag, Prime Minister. No one, including the President of India could enter into Kashmir without Kashmir’s Prime Minister’s permission. In order to oppose this, he once said “Ek desh me do Vidhan, do Pradhan aur do Nishan nahin chalenge”(One country cannot have two constitutions, two Prime Ministers and two National Emblems). Syama Prasad Mukherjee went to visit Kashmir in 1953, and went on a hunger strike to protest the law prohibiting Indian citizens from settling in a state in their own country and the need to carry ID cards and was arrested on 11th May while crossing the border along with Guru Dutt Vaid and Tekchand Sharma. Syama Prasad Mukherjee was kept under detention under the rule of Sheikh Abdullah, the then Prime Minister of Kashmir and a close friend of Jawaharlal Nehru. In less than two months under detention, he passed away on June 23, 1953 under mysterious circumstances. His death in custody raised wide suspicions across the country and demands for independent enquiry including earnest requests from his mother, Jogmaya Devi to the then Prime Minister of India, Pandit Jawaharlal Nehru. Unfortunately no enquiry commission was set up and his death remains a mystery. Dr Syama Prasad Mukherjee will be regarded as having died a martyr’s death in Kashmir. It is a grim tragedy that a great patriot of his stature should have died a premature and unseemly death while in detention without trial. Syama Prasad, in order to foil the evil design of Sheikh Abdullah, the self-proclaimed Premiere of Jammu and Kashmir, not only gave up his precious life for the sake of the country but forced the Government of India to accept that there must beOne Nation, One Nishan, One Vidhan and One Pradhan in India.